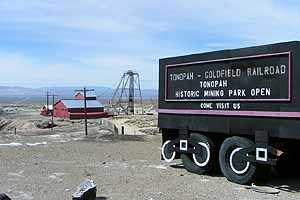 I saw one of your travel reviews about Goldfield on line. We took Mylo for a little tour of Nevada museums, parks, and oddities last week. Mylo is 5 now, and we were surprised by some of the things he enjoyed most: the sandstone formations in Valley of Fire, and the Hoover Dam Museum in Boulder City at the Boulder Dam Hotel (he liked it even more than the Vegas Lied Children’s Museum!) 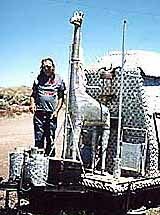 We also really enjoyed the Slim Sirnes art cars in Goldfield, Rhyolite and the Goldwell Open Air Museum. 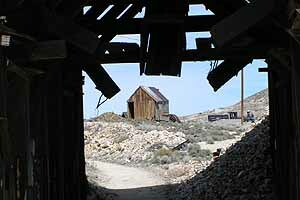 One of the pleasures of staying overnight in Tonopah is the free tour of the historic Mining Park you can take the next day. 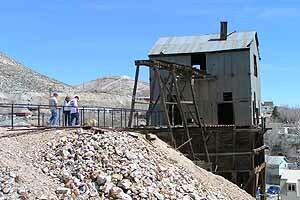 The Mining Park overlooks Tonopah from the east. The 100-acre Mining Park is located on the site of the original claims overlooking the gaunt old city from the east. The Visitor Center originally housed the Tonopah Mining Company’s power substation and telephone switchboard. 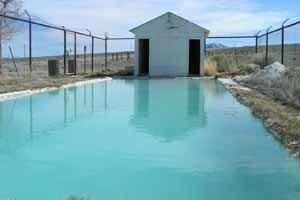 In the 1960s it was used as as an assay office by Howard Hughes’ Summa Mining Corporation. You can spend a pleasant hour or two exploring the park at your own pace. Now it’s the Park’s administrative office, with a gift shop and exhibits. 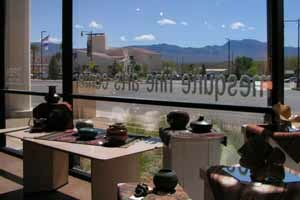 Among the coffee mugs, t-shirts and glittering souvenirs are books on a variety of Nevada subjects. Along with classic volumes like Stanley Paher’s “Nevada Ghost Towns and Mining Camps” are more specialized titles such as a history of Railroad Valley and books on rockhounding and wildflowers. It’s a great place to add to your Nevada bookshelf. The Burro Tunnel leads to a steel viewing enclosure over a 500′ drop. A self-guided tour begins at the Visitor Center and wanders through parts of four of the old city’s major mining operations. You’ll enter a variety of mining structures, including the recently completed Burro Tunnel at the site of one of Jim Butler’s original discoveries. 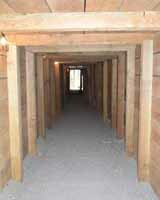 This timbered and well-lighted tunnel leads to a steel ‘cage’ firmly secured over a 500-foot drop. Head frames, hoist houses, a railroad trestle, powder magazine and other structures are scattered across the gritty hillside. The structures are maintained in a state of “arrested decay”. 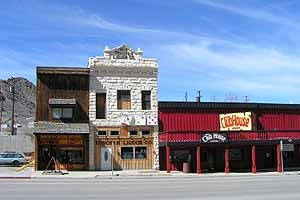 One of the buildings is more interesting for its non-mining associations. In the summer of 1949 a young woman named Barbara Graham moved here for a little while. She had left the life of prostitution and petty crime she’d lived in California to try to turn things around in Tonopah. She was a nurse’s aide, then managed a small restaurant, working long hours in the kitchen and waiting tables. She even married a man she met here, and moved into this little house. Bill Metscher and his brothers were kids then, and they would catch mice and put them through the knot holes in the house to scare her. Even without the local brats to contend with, life in Tonopah was hard and unrewarding, winter was cruelly cold, the marriage was no picnic, and one day she said to hell with it and hopped the Greyhound for L.A. Four years later she was involved in a gruesome murder in Burbank, and in 1958 she was the last woman legally executed in California. From April through September the park is open 9-5 daily; October through March the hours are 10-4, Wednesdays through Sunday. Admission to the Visitor’s Center is free. If you stayed overnight in a Tonopah lodging house the walking tour is free, otherwise it’s $3 single, $5 couple, $7 family. From Tonopah we went east on US 6. 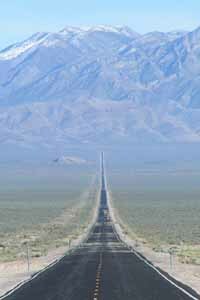 If there is any US highway that qualifies as “The Loneliest Road in America”, this is it. 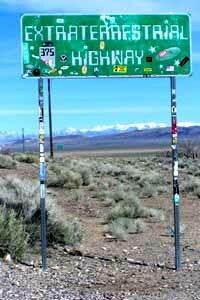 From Tonopah to Ely, 170 miles, there are no towns and only very occasional reminders of mankind. earlier days this was a favorite bathing stop, a small pool fed with natural hot water. It’s been closed now for many years, but there is a hole in the chain-link fence suggesting that the pool is still in use. Springs is another five miles south, another pioneer swimming hole behind a chain link fence with a hole in it. There are signs threatening development of a casino on the beautiful tree-shaded site, but no bulldozers yet. We were three days in Mesquite, marveling how an old Mormon farm town has become a trendy retirement community with gambling and golfing destinations at freeway offramps on each end. There are still half a dozen residences left on Main Street, and a few more of the original commercial structures, but most of Mesquite is new and getting newer by the day. 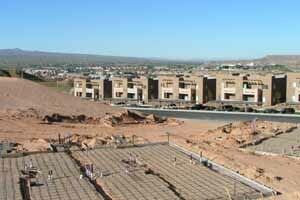 The little town’s transformation might best be expressed by two structures side by side near the center of the old town at Mesquite Blvd and Yucca Street. One is the Virgin Valley Heritage Museum (open Tuesday through Saturday, 9-5, free admission), built in 1941 by local school kids as a National Youth Authority project. Cement was the big expense, the gravel, rocks, flagstone, and pine poles were gathered locally and the lot cost $150. Next door is the Mesquite Fine Arts Center, a sleek modern structure devoted to the work of local and regional artists working in all media. The contrast between these two neighbors, one gazing backward, the other forward, could hardly be more profound. 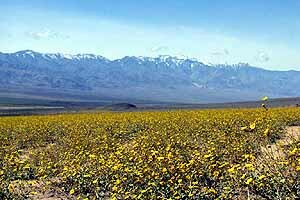 In case you missed the wildflower show at Death Valley, they’ll be blossoming progressively farther north into June. celebrating its 50th anniversary April 20 and displaying photos of some of the more than 475 performers who have entertained there. The first of them was Liberace, and his 1954 Rolls Royce is displayed, on loan from the Liberace Museum . . .
April 20 is also the date Wayne Newton leaves the Stardust. “Voice problems have dogged him for years, and crowd counts have slipped dramatically,” writes R-J columnist Norm Clarke. But he’s still the brightest star so far in our home-grown galaxy of talent . 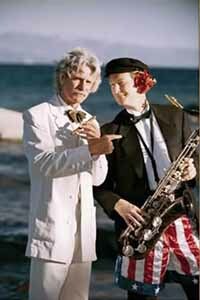 . . A new supernova may have been discovered, though, as McAvoy Layne (The Ghost of Mark Twain) and Baron von Remmel combine to tell “Nevada’s Story” in song and story. The premiere performance will be 8 pm on May 7 at Comma Coffee in Carson City. Admission is $10, with all proceeds donated directly to the BAC Stage Kids.